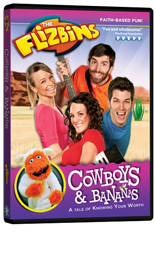 "Great songs, fun dances, and crazy banana showdowns await in Cowboys & Bananas, the second adventure for the musical praise band The Flizbins. First, SuperFin, the greatest Flizbin superhero, saves the day when Hero City's cleaning robot goes haywire. Then, through a wacky and woolly retelling of the story of the lost sheep, Finley and the band discover just how important they are to God, even if they aren't superheroes. Starring a cool band full of catchy songs and moral messages, The Flizbins is an award-winning children's show that features live action characters and a furry puppet named Finley. From Charity, the purple-clad guitarist with a talent for creating new dances and songs about Jesus, to Tim, the band's bassist with a charming Aussie accent, The Flizbins and their tree fort-dwelling friend present positive role models for youngsters. BMG also carries the first episode, Pirates & Cupcakes." "I love the music! ", Daughter age 7 as she dons her cowgirl hat. They even have them get up off the couch and learn a good ole cowboy dance! 3 short shows so you can keep the attention of the smaller set, but exciting enough for older elementary kids. Faith based fun, dove approved for all ages. The Flizbins take a tried and true approach to the retelling of Bible stories and applying them to young children today.. puppets!! I sit here while my young ones watch and hear them laugh! Real actors, and puppets are a combination that even the best animation can not beat!! I recommend this series for your home library especially if you have young children! Visit Bridgestone Media to pick up your copy! !